A sports bike in its purest form. Reduced to the essentials. Agile, fast, suitable for A2 driving license and extremely sporty. Whether you are on country roads or the racetrack, the Moto3 genes are perceptible in every manoeuvre and convey pure race feeling. The handling – simply spectacular. The performance – incredible. The power – awesome. SEAT: The two-part seat offers first class supersport ergonomics with perfect support for rider and pillion. With a seat height of 820mm enables the rider to have a secure stand while also being high enough for sporty use and real big-bike feeling. For MY 2017, rider’s seat will be even more comfortable with 12 mm thicker cushion. HAND LEVERS: For MY 2017 the clutch and the brake lever are adjustable, to get the pressure points exactly to where the rider wants them. FUEL TANK: A steel fuel tank with 10 l capacity (including 1.5 l reserve) has been developed for the RC, perfectly matching the supersport style and vehicle design, together with rider ergonomics. Thanks to the economic engine, the RC achieves even in the sportiest manner of riding a considerable range. WINDSHIELD: The advanced design windshield in combination with the aerodynamic optimized motorcycle front ensures incredible wind protection for rider’s chest and arms. BODYWORK: The brand new bodywork, footrests and pedals not only provide a unique supersport look but also help the RC to master extreme cornering by allowing a greater leaning angle. 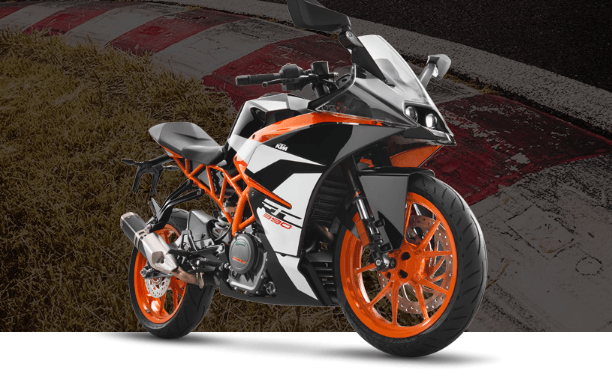 THIN TAIL: Fitting perfectly into the pure racing look, the number plate holder rounds KTM’s high performance bike off. 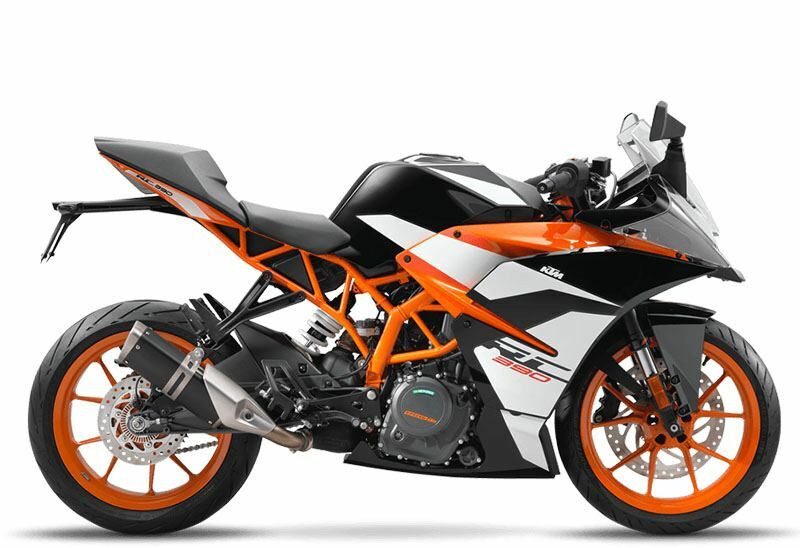 ENGINE: The state-of-the-art, liquid cooled, single-cylinder, four-stroke 375ccm engine with twin overhead camshafts, four valves and electronic fuel injection, already equipped in the Duke 390 provides outstanding power and thanks to the balancer shaft, delivers the highest level of smoothness. 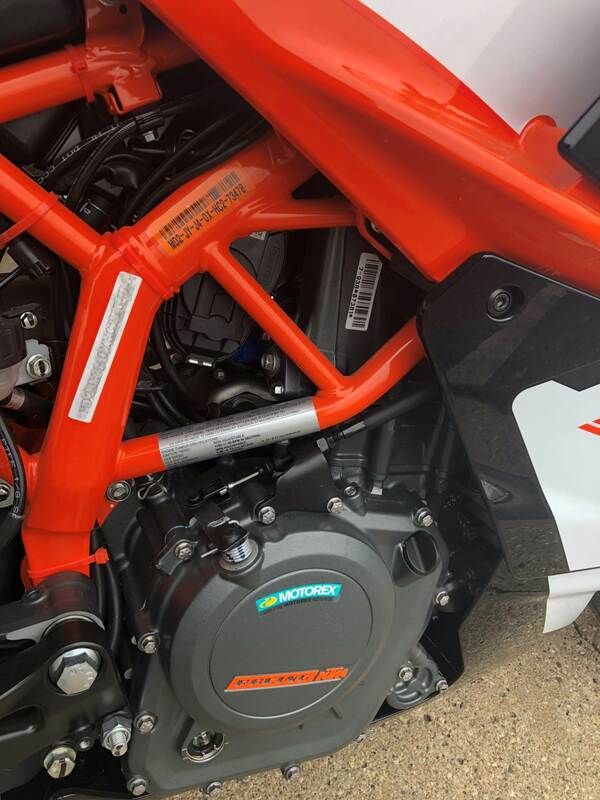 Because of the KTM-typical compact design with stacked transmission shafts the engine has an unbelievable low weight of 36kg. Combine that with technical details like a forged piston, Nikasil-cylinder-coating and forced feed lubrication with power-promoting body-evacuation and you get an engine which provides a remarkable 44hp. The engine is equipped with an electric starter powered by a 12V/8Ah battery. SLIPPER CLUTCH: Saves power, helps in slides: The new slipper clutch not only opens when the engine back-torque becomes too high, it also closes with the force of the clutch springs when you open up the throttle. The former prevents annoying rear wheel chatter when braking sharply or decelerating – and gives the wheel just that bit of braking for a controlled rear wheel slide. The latter allows the clutch to be pulled and controlled with the little finger – which saves energy when riding. RIDE-BY-WIRE: The guarantee for smooth throttle response, not just no throttle control cable: The RC 390´s ride-by-wire system ensures perfect application of the readily available and plentiful torque. 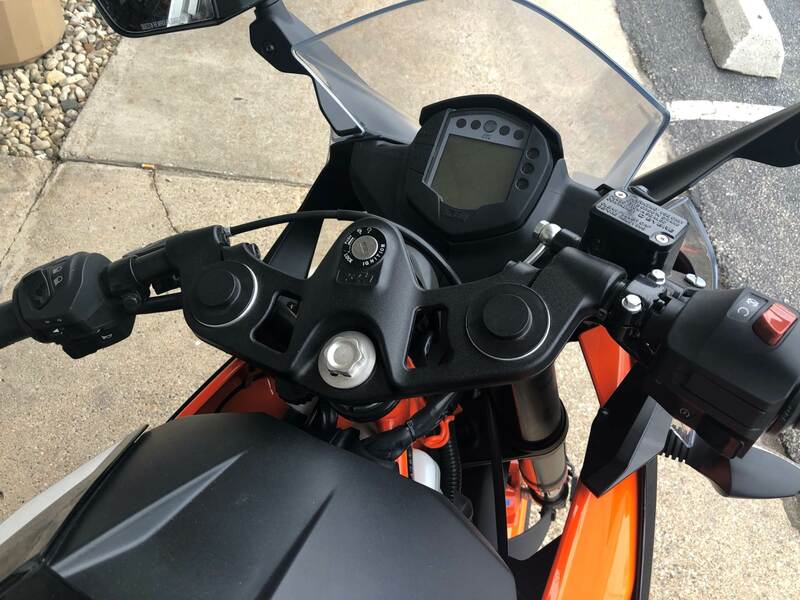 It also electronically translates the throttle commands of the rider into throttle valve positions perfectly suited to the riding conditions. The DBW system is fully compliant with the strict DIN 26262 safety standard from the automobile sector. BRAKES: KTM - in cooperation with Brembo - developed a powerful, excellent to dose brake-system which allows the rider to be always in full control of the RC. A four piston radially bolted caliper in combination with a bigger single brake disk (320mm diameter) in the front and a single piston floating caliper with a single brake disk (230mm diameter) for the rear wheel guarantee excellent breaking reaction even in the sportiest manner of riding. 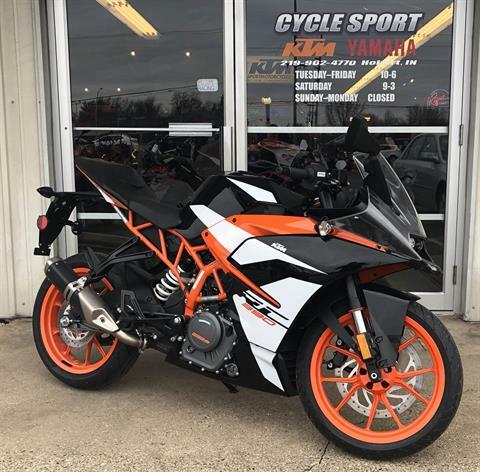 PILLION RIDE SEAT: In order to make no compromises in terms of supersport look the KTM engineers integrated the pillion seat into the bodywork lines so that it looks like a real racing bike tail, but ensuring excellent comfort for the passenger. STANDARD ABS ABS: is equipped as standard on every RC 390, ensuring maximum safe on any road condition. When taking the RC to the racetrack ABS is of course disengageable. WHEELS: Equally lightweight as stable, the 17in orange painted cast light alloy wheels are fitted with grippy Metzeler tyres - 110 mm wide at the front and an impressive 150 mm at the rear. The tyres impress with tremendous grip in both wet and dry conditions, as well as providing supreme durability. 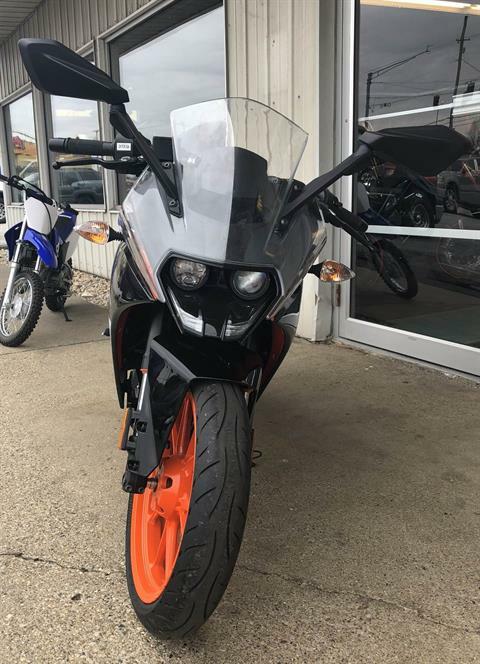 NEW RIDERS: With a power/weight ratio of 0.2 kW/kg, the RC 390 is the sportiest option for new riders. SILENCER: The KTM RC 390´s completely newly designed exhaust system is a combination of stainless steel underbelly pre muffler and aluminium absorption-type final exhaust, similar to the system of the “BEAST”, the KTM 1290 SUPER DUKE R. It combines centralisation of masses, strong and smooth power delivery and excellent emission values. 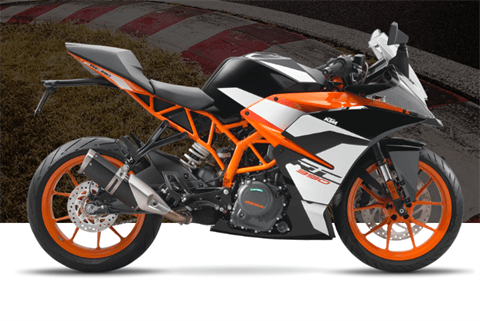 FRAME: Visually similar to the lightweight and approved Duke steel trellis frame, the orange painted frame has been modified to better fit the supersport ergonomics and dynamics. The increase of the steering head angle to 66,5 degrees results in a shorter trail, shorter wheelbase and increased ground clearance. All these modifications release the complete racing potential of the RC and guarantee quick, agile and playful handling. SWINGARM: The light alloy swingarm with directly linked WP shock absorber excels by providing extreme torsional stiffness and outstanding tracking stability. TELESCOPIC FORK: The KTM RC 390 high-quality upside-down fork from WP Suspension has the same 43 mm outer tube diameter as the RC8 R – in other words: real racing equipment that guarantees highest levels of stability and precision. INSTRUMENT: The 100% digital LCD display has everything you could expect from a state of the art KTM motorcycle, including engaged gear, fuel gauge and service reminder information. 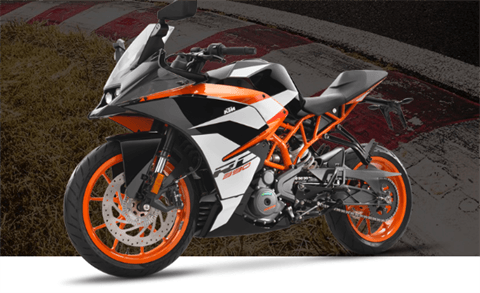 Just like supersport racing machines an RPM alert indicates when is the best moment for shifting up.